Before having a monster 2009 post season, Alex Rodriguez had been much maligned for not being a clutch player. Even before this past post season, however, such assertions were downright silly. After all, since joining the Yankees in 2004, only four other players have compiled a higher WPA (Win Probability Added) than Arod (also, among players with at least 1,250 PAs during that time span, Arod ranks 12th in terms of WPA/PA). By just about any measure, Arod has been very productive in so-called clutch situations. However, signature moments often overshadow compiled stats when the game is on the line (i.e., everyone remembers the game winning single, but not the two out double that preceded it). Even by this lofty standard, Arod still stands head and shoulders above not only his Yankees teammates, but most players in the game. From 2004 up until last night’s comeback victory over the Red Sox, the Yankees have hit 41 homeruns in the ninth inning or later that either tied the game or gave the Yankees a lead/walk off. Of that total, Arod has accounted for 13, or nearly one-third. What’s more, the Yankees have hit 20 such home runs in their post season history and Arod has two of them. In other words, Arod has not lacked for signature moments during his Yankees career. 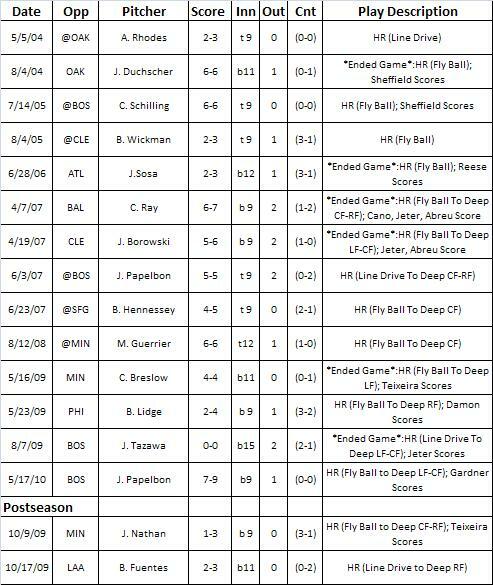 Listed below is a detailed account of each clutch moment (as defined above), courtesy of baseball-reference.com.